A recent article by William Cook (Guardian) describing a trip to Manchester’s Lowry centre reminded me both of a painting which hangs in my childhood home, and an article by D W Meinig which has helped me think with more focus about the connections between art and geography. Cook provides a short but informative piece on the regeneration of the Salford Quays and a précis to the work and life of ‘Salford’s favourite son’, L S Lowry. 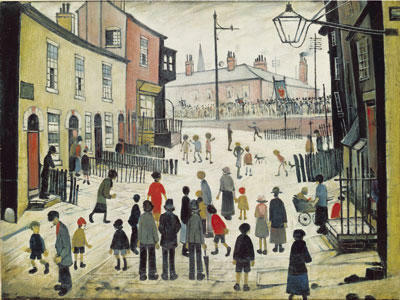 Lowry’s work, described by Cook as ‘matchstick men and matchstick cats and dogs’, represents most commonly Manchester’s 1920s and 30s industrial landscape, and can be read as sharp pictorial evocations of the British industrial revolution. Lowry’s style, influenced by the French Impressionists, treats the everyday and banal with intimacy and fondness, with scenes such as A Procession (above) evoking a sense of cultural wealth amongst the industrial working classes. Amidst other arguments in his 1983 paper, D W Meinig rejects the common void between the arts, humanities and social sciences, and argues for the essentiality of the relationship between art and geography. Following Yi Fu Tuan, Meinig suggests that art “not only provides essential clues about human experience with environment, it also contains models for dealing with some of the most difficult problems of descriptive synthesis” (317). In describing (or representing) place, artists also help to shape it: artists are ‘mythmakers’ suggests Meinig, and it is this writing of worlds that remains at the very soul of geography. Most pertinent to cases such as Lowry’s, however, might be suggestions that geographers must “part company with those who insist that a geographical description should be replicable” (322). Our own subjective perceptions, much like Lowry’s representative idiosyncrasies, are intrinsic to the experience and study of space and place. And as Meinig argues, our partial and imperfect geographic descriptions must be celebrated and must form the foundation of a fuller humanistic geography. This entry was posted in Uncategorized and tagged Art and geography, Cultural Geography, LS Lowry, Social Geography, Urban Geography on March 22, 2010 by matthewrech. Writing in Geography Compass, Sheila Hones charts the development and evolution of literary geographies. From its origins in comparative studies of geographical description, the use of literature in the study of geography has challenged disciplinary boundaries and has influenced scholarly approaches to space and place. In particular, Hones highlights new developments in the field of literary geography that consider fiction and poetry as explicitly spatial, with the “reading-writing nexus as a contextualised and always emerging event” (1302). The geographies of literature are always arguably twofold, Hones suggests, “the first being the geography of the initial text event, and the second being the geography of the context in which the reader’s experience of that event is later narrated” (1302). Whilst then the possibilities (texts, events, readings, moments) are manifold in the geo-graphing of literature, it might be helpful to focus on particular examples. Reviewing for the Guardian, Giles Foden celebrates the first English translation of JMG Le Clezio’s Desert (1980). Preoccupied with migrations and ‘separations from the natural world’ (“issues [that] have become critical globally”), Desert tells the tale of two North African Tuareg children who are variously dispossessed by war and imperialism. Told from “two viewpoints, and in a double time scheme”, Desert may provide a good starting point, replete with its “array of people, places, times, contexts, networks and communities” (Hones, 1301), from which to consider the possibilities of literary geography. This entry was posted in Uncategorized and tagged Cultural Geography, Environment and Society, Global Issues, JMG Le CLezio, literary criticism, literary geography, Migration, Social Geography on March 9, 2010 by matthewrech. With the recent success of Kathryn Bigalow’s The Hurt Locker at this year’s BAFTAs, we are reminded of the enduring popularity of dramatised accounts of war. Awarded with no less than six BAFTAs, The Hurt Locker accounts for the “long and painful endgame in Iraq” (Bradshaw), with a specific focus on the hearts and minds of US combatants. 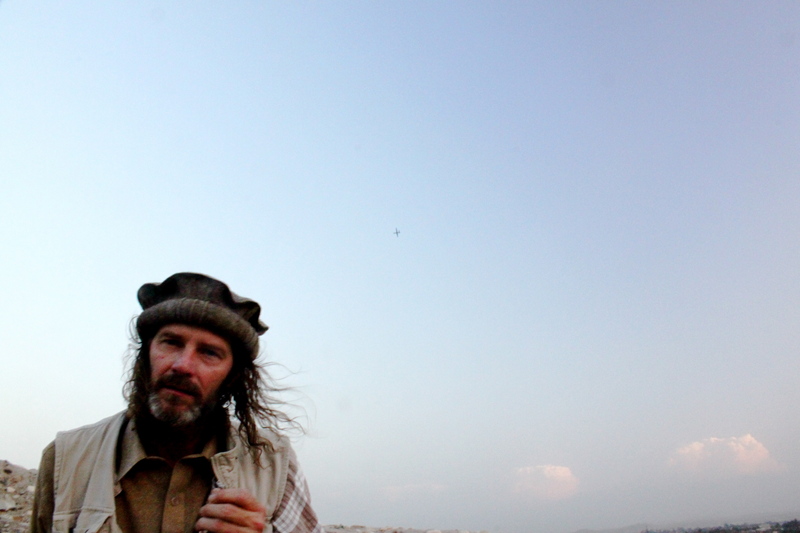 All told, as Bradshaw continues, The Hurt Locker, with unpretentious clarity and freshness, provides an alternative account of the ‘war on terror’. Pausing to consider the relevance of war films in western culture, and particularly accounts such as The Hurt Locker, necessarily prompts us to consider also their political salience. Writing in Geography Compass, Klaus Dodds provides a good overview of work in critical geopolitics, international relations and security studies that posit film as component in framing the structures of global politics. Focusing on one of Dodds’ key arguments for a more progressive study of film in geopolitics (that of prioritising genre and sub-genre as complicit in the construction of identity politics), we find a way of contextualising films like The Hurt Locker more productively. For example, as Dodds suggests, genre matters because it “permit[s] the audience to potentially anticipate character development…[and]…also to…anticipate and predict the denouncement of specific films” (480). So, whilst The Hurt Locker might be considered subversive in terms of plot, focus and dominance over it’s larger grossing contemporaries, siting this film correctly in the economic, cultural and ’emotional landscapes’ of film (see Maltby in Dodds) might enable us to more readily interpret it’s significance in the framing of real-world geopolitical narratives. This entry was posted in Geography Compass and tagged Cultural Geography, Film, Geopolitics, International Relations, Political Geography, Security Studies, The Hurt Locker on February 24, 2010 by matthewrech. Writing a couple of weeks ago in the New Scientist, Ethan Watters describes the exportation and globalisation of mental illness and its treatment. Focusing on the particular example of post traumatic stress disorder, Watters suggests that whilst “mental illnesses are not evenly distributed globally, and do not take the same form from place to place”, it is perhaps one of the greatest achievements of globalisation that such “culturally distinct expressions of trauma” are not only conceptualised through, but incorporated into, a homogenous, American version of mental illness. A further case study of Watter’s report is the example of the treatment of mental illness after natural disasters, wars and genocides: all notably ignorant of “the local idioms of distress”. 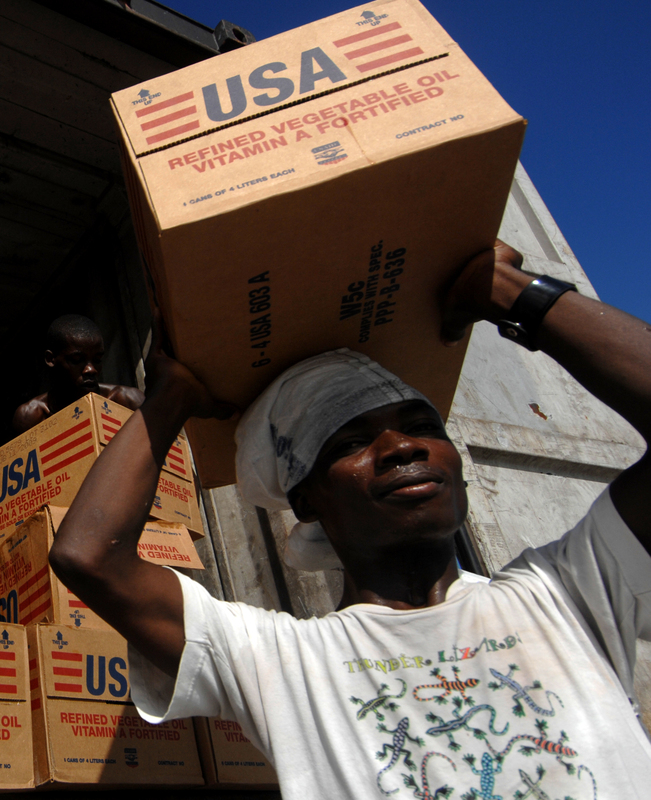 Using the recent devastation of Haiti as something to help us ground these ideas, it is interesting to think of Watters’ exportation of mental illness alongside more general discourses of aid and development. Writing in Geography Compass, Andrew McGregor provides a review and history of post-development studies, with a special emphasis on an ongoing struggle to “demystify and challenge the taken-for-granted goodness and vagueness that has surrounded development since its inception” (1699). Although necessarily going beyond the theme of mental illness here, McGregor usefully describes post-development “from its early angry incarnations to its current experimental and optimistic mood” (1688), and lays the foundations for a more grass-roots, practice-based approach to development. Such an approach would mean debunking reified structures of meaning and practice (not unlike the application of anglo-american conceptions of mental illness), and ‘couching the study of post-development in the languages of hope and possibility’. This entry was posted in Geography Compass and tagged aid and development, Development, Global Issues, Mental illness, post-development theory, Social Geography on February 8, 2010 by matthewrech. This week, the Guardian reported that the UK police force are planning to deploy unmanned aerial vehicles (UAV) for the routine monitoring of motorists, protestors, agricultural thieves and fly-tippers (Lewis). Documentation obtained through the freedom of information act suggests that a partnership between BAE Systems and a consortium of government agencies led by Kent Police hope to inaugurate their ‘national drone plan’ with surveillance operations during the London 2012 Olympics. Routinely in the news, and infamous for their use in reconnaissance and air strikes in Afghanistan and Iraq, the military-style drones will be adapted for use in the UK, with current models being limited by air-space law. The financial cost of ‘revolutionising policing’ in this way, Lewis reports, will be offset by spreading the initial outlay across several government agencies, and by the aircraft ‘undertaking commercial work during spare time’. Although it is possible for us to frame this story in a number of ways (surveillance, civil liberties and policing, post-human and military technologies), relatively new work in the geographies and geopolitics of aerial spaces might provide a cogent framework with which to assess the implications of airborne covert surveillance. Writing in Area, Alison Williams ties together an ever-growing literature in aerial geographies/geopolitics, and emphasises the importance of thinking in 3D: of considering the vertical and volumetric aspects of the geographies of states. Although Williams’ article is concerned with the territorial integrity and contingent sovereignty issues in relation to military violations of airspace, an emphasis on the complexities associated with “strategies of security and securitisation increasingly enacted by powerful states” (57) through utilisation of sovereign airspace, remains pertinent to the discussion. Here, and “as UAVs become the dominant modes of aerial attack” (57) (or in this case, surveillance), the lessons learned from considering the technological, political and moral implications of incursions into sovereign space might usefully be used to consider the future geographies of civilian domestic surveillance. This entry was posted in Area and tagged aerial sovereignty, airpower, airspace, Cultural Geography, Drones, Political Geography, securitization, Social Geography, Surveillance, UAVs on January 25, 2010 by matthewrech. Simon Dalby, writing in Geography Compass, provides a compelling argument that prompts us to reconsider our place in the world, and to challenge implicit geographies associated with globalisation, geopolitics and the environment. As Dalby suggests, “some of the most taken for granted and obvious parts of environmental political thought are assumptions about context and environmental circumstances” (104), and it must be our role as geographers to continue to critique geopolitical categories and scientific understandings that shape political discourse. Specifically, and in relation to the ongoing Copenhagen summit, Dalby takes issue with certain spatialisations used to organise our understandings of the world, which might often be out of line with the new contexts of our lives. These new contexts (meaning post September 11th politics, the transformation of humanity into an urban species, and new thinking in earth systems science) demand a rethink of the categories we use to make sense of our place in the world. So, as we are beholden to the twists and turns of the climate summit this month, we should be mindful that “the taken for granted nature of geographical categories – states, regions, blocs, continents, resources and environments” (104) – shape political will and discourse. And also, that whilst “geopolitical reasoning is mostly about the view from the metropoles of the global polity” (104) we must remain cognisant of strategic silences, and the unheard voices of those that climate change may threaten most. This entry was posted in Geography Compass and tagged Climate change, Copenhagen Climate Summit, Cultural Geography, environment, Environment and Society, Global warming, globalization, Political Geography, Social Geography, Urban Geography on December 14, 2009 by matthewrech. Foregrounding and accompanying the release of Microsoft’s latest operating system, the “I’m a PC and Windows 7 was my idea” advertising campaign has become the latest in a line of marketing tools that suppose specific connections between products and potential consumers. For example, as Dell emphasise the veritable sweet-shop of choice and variety available to the discerning customer, so Microsoft opt to empower the consumer through placing them at the forefront of the development process. Here, consumers have creative control, are able to express themselves freely and individually, and in the case of Microsoft, are the literal embodiment of their chosen operating system. Whilst arguing for the inclusion of a political economic analysis of mass media and culture in Geography, Clayton Rosati provides a compelling argument as to the possibility of using such examples of corporate enterprise to explore the industrial production of culture. As Rosati suggests, “through [the] deployment of media machinery, media companies…can better captivate emergent structures of feeling and as such better transform the means of cultural production to intensify the industrial production of culture” (571). Thus, the necessity for corporate enterprise to “perfect its enchanting song and the means of delivering it above the din of every other song” (571), necessitates a similar propensity to manage, and further, to transform consumer taste and preference. Whilst, in terms of the example of the advertising for Windows 7, we may debate the ’emergent structure of feeling’ we might associate with the ubiquity of computing technologies, Rosati’s article places a notable emphasis on the importance of the spatialities of industrial production. “Geography is central to this process, not simply in containing the infrastructure of the industrial production of culture, but also in defining its proprietary limits…and further unifying its consumers in a shared exclusion” (571-2). Here, not unlike ‘The spatial politics of virtual worlds’, seemingly intangible and elusive networks of power are placed within international and spatial divisions of labour. This entry was posted in Transactions of the Institute of British Geographers and tagged Advertising, Cultural Geography, Economic Geography, Microsoft, political economy, Political Geography, Social Geography, Windows 7 on November 30, 2009 by matthewrech.